Kawai ES100: What makes the Kawai ES100 stands out in the Digital Piano Market? 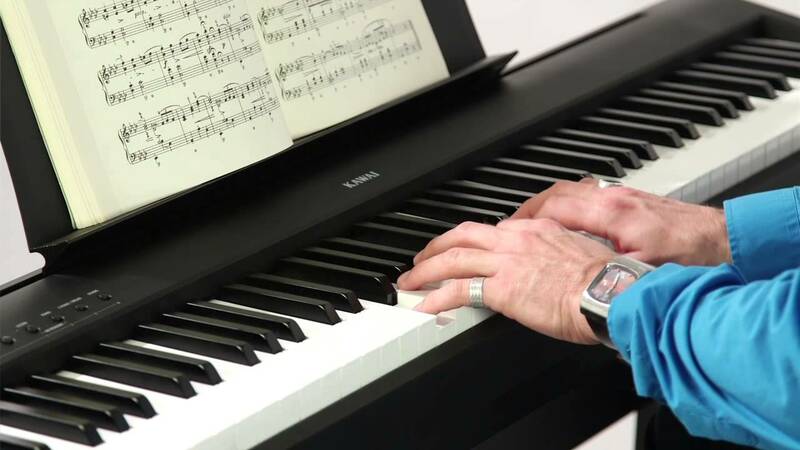 Hi, My name is Stu Harrison, and I am coming to you from Merriam Pianos today and we are going to be talking about the #Kawai ES100 #digital #piano. Now, this a model that’s caught quite a bit of attention over the last few months since it’s been out on the market, and I had a chance to try this instrument myself on a couple of gigs and I really enjoyed the experience. I wanted a chance today to walk you through few things that I really noticed about it that caught my attention, especially for the price point. How usable is in terms of its functions and the button layout? So when I play the ES 100 the first thing that I notice is I am not playing a $1000 keyboard. This to me feels like something that just one or two years ago would have easily been priced in $1500-$2000 range. One of the things that I’ve come to expect from $700 – $900 keyboards is when I play the action, they always tend to feel a little sluggish, and the return speed tends to be a little slow as well. When I play the ES 100 the action is nimble and responsive, but it does not feel light weight: there’s still some substance to it, and it still feels like I’m getting the right amount of resistance. I can still do a good amount of classical or jazz on here and still be confident in the dynamic control. Also, when you’re on the keys and you apply lateral (sideways pressure) to the keys, you’re not feeling that gap in the keys were you can feel that there’s a bit of a click or space in the manufacturing. It’s something that just sort of screams”I am playing a low-cost keyboard”. There’s none of that on the ES 100. So in terms of how it feels, this to me is going to be right up there with an 8.5 out of 10, and I’m judging that against the most expensive machines in the industry. The second thing I noticed is definitely a sound. Now, when you’re again looking at instruments of this price point, most of the manufacturers out there using very basic sampling. We’re talking one stereo sample for every three or four notes (sometimes even an octave); the complexity of the tone isn’t there, and you don’t really get a sense that you’ve got any overtones happening – it’s a very basic playing experience for those of us who are used to playing on really, really nice acoustic pianos. And when I play this instrument, whether it’s classical or whether it’s jazz, there’s a great range and control that goes well beyond its price point. Without the use of a soft pedal, or adjusting the volume, I still have an incredibly fine amount of control in terms of the tone and timbre. The third thing I like about the ES 100 is its simplicity in terms of its controls. You’ve got a button for the piano sounds, you got a button for your e-piano and organ sounds, and the others refers to few different pads and strings that you can you can cycle through if you need those extras. To access your piano sounds , you’re able to press and cycle through the various options, such as electric pianos. In terms of the weight, this instrument weighs half as much as what I’m currently using to gig on – easily one person, single-handed with a gig bag, is going to be able to take this with them in almost any size car, and still walk for a decent distance without killing themselves. Just from feel, the instrument weighs 40 lbs or so (check on www.kawaius.com for exacts). ES 100 from Kawai; if you’re a musician, or starter or hobbyist player, and you got a budget of $1000 or less, I don’t know how you could avoid this instrument in the marketplace right now. It is going to give you everything you need: fantastic sound, an action that makes you feel like you’re playing a really super high-quality professional instrument, highly navigable in terms of getting around the controls of the instrument, and very portable – easy to get around. So come down and see us at MERRIAM Piano’s: have a look at this machine, the ES100 from Kawai. It’s waiting for you! This entry was posted in Digital Pianos, Kawai, Merriam Pianos Blog, Piano Reviews and tagged digital, digital piano, digitalpiano, kawai, kawai es100, kawai es100 canada, kawai es100 review, kawai es100 toronto, Kawai Musical Instruments (Business Operation), piano.